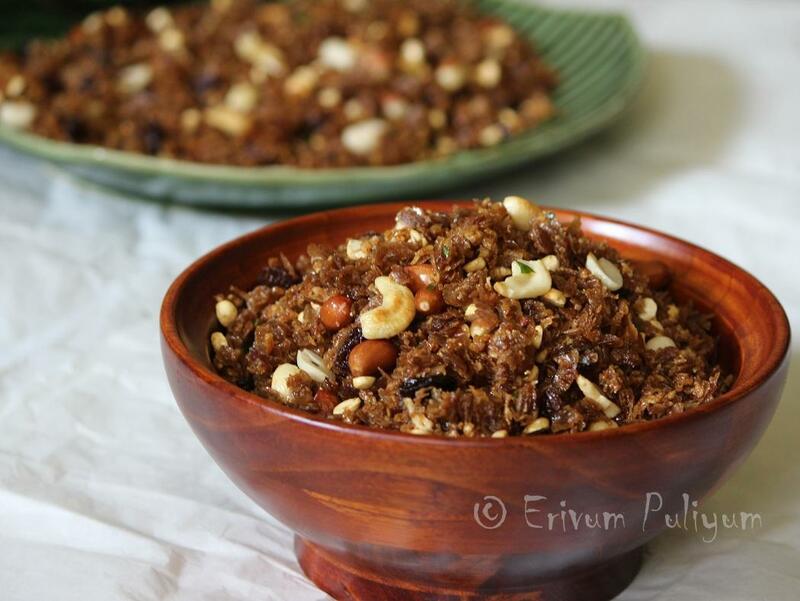 One of the common sweet dishes in Kerala is the Aval velayichathu(sweet poha). In some places its known as aval pani or aval varratiyathu.Usually during my hostel stay in college,my mom used to prepare it for me as this could be stored for days in air tight containers. My friends wait my come back eagerly after vacation to taste their aunt's aval velayichathu..And storing?? never got a chance to store for long and would finish off in 1 or 2 days..
Oh! I took you all back to the college times..much fun and less worries.Now, life has changed a lot with family.So,just brushed this out to feed my kids a new recipe.Aval veliyachathu is a familiar recipe with keralites, a very healthy one for kids.Its usually prepared using beaten rice,coconut and jaggery ;garnished with all nuts. Soak the jaggery in 1/2 cup of water and boil until dissolved.Strain the impurities and keep aside. Place a non stick pan and dry roast the coconut till the moisture is dried and don't wait to dry roast it well. A wilted coconut with no moisture like is correct consistency.However in case you need to store long then you may dry roast the coconut well.Drain on a plate. In the same pan,add the beaten rice and warm it up,keep aside. 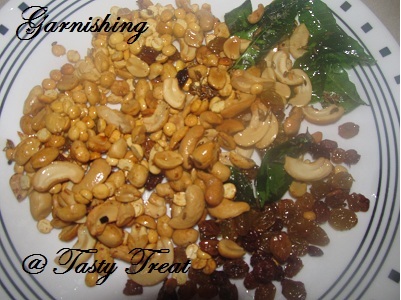 Heat ghee in a pan and fry all the nuts until slightly browned and add in the curry leaves,fry and drain on a plate. Keep aside. In another thick bottomed pan and pour the jaggery syrup. Keep stirring on medium flame till large bubbles appear. Check the pani /jaggery mix for correct consistency. (place between your thumb and index finger,it should have thread consistency or drop a little in a bowl with cold water,it tends to form a soft ball or a soft line). Add the beaten rice and coconut to the pani(jaggery) and mix well. Add all the garnishing and mix well. Keep stirring till the beaten rice starts to leave from the sides of the utensil. Sweet poha is ready to serve. 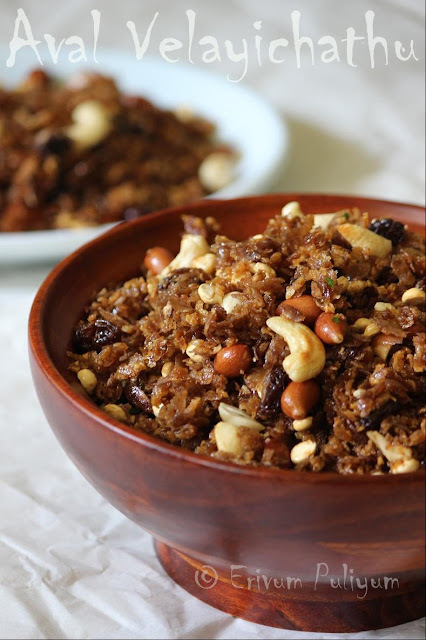 *Don't mix the poha till the pani/jaggery has reached correct consistency. *Store in air tight containers for future use. * You can even use oil instead of ghee if u wish. You can use ghee plus coconut oil too. * I used the red colored (kerala style)beaten rice thin ones,you can use the regular white ones. But if you are using thick aval then the jaggery syrup needed may be more as it soaks up more. It better to use thin flakes for this snack. * You can even add sliced coconuts for added crunch. Will make a nice snack during the evenings and what more quick too. Vow, super delicious recipe, new for me, drooling here.. Wonderful recipe! I love sweets and this will be great weekend assignment for me! Yummmy! so tasty n fullfilling....super yummy recipe..
Nice snack. Cumin seeds and raisins with aval, sounds interesting!! Simple and yummy snack...had lots when I was a kid :)..nice clicks.. This sounds very interesting and packed with protein to the punch; with all them nuts! I love this one... with the brown poha..
wow I love the sweet poha! reminds me of Krishna jayanthi :) lovely pictures ! This looks lovely! Thank you for stopping by my blog. I'm following you back as well. Will be back visiting again, have a nice day! Quick and easy .. perfect snack. I'm so loving this...actually vaayil vellam varunnu. 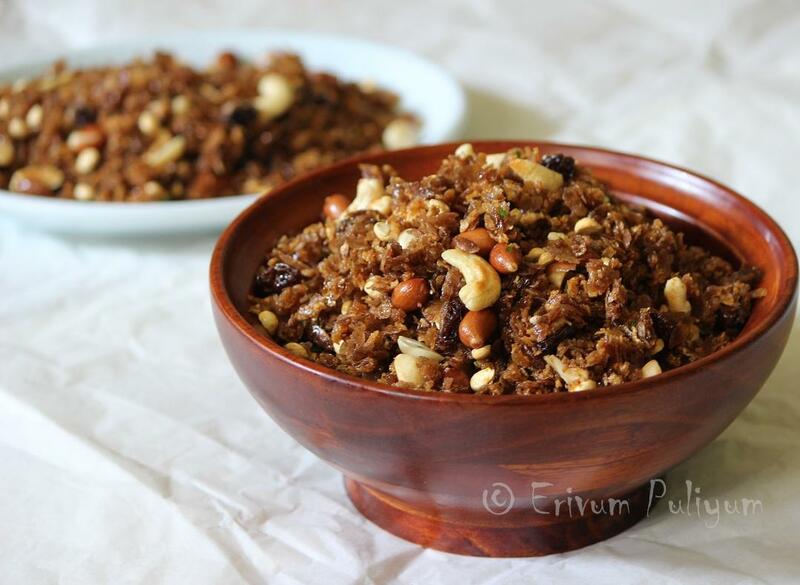 We usually make aval nanachathu which is nothing compared to the aval varattiyathu! A small appreciation to ur fabulous blog. 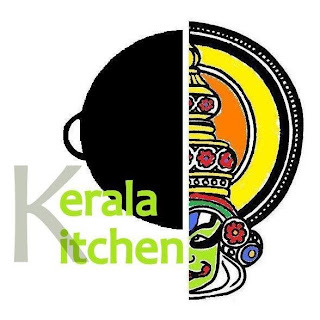 Please collect it here http://karaikudicuisine.blogspot.com/2011/05/my-first-award.html.